The birthplace of three of the world's major religions, the home of the world's oldest known civilization, hotspots where people are fighting and the important world's resource-oil, make the Middle East, the region where the continents of Asia, Africa and Europe met , important to the rest of the world.Did you know that the longest river in the world is found here?It is the Nile river and is found in the country of Egypt. The country of Turkey is one of only two countries to be located on TWO continents. The other is Russia. 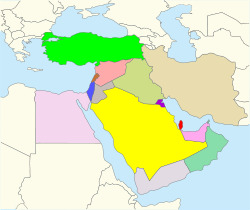 Introduce your students to the Middle East with this short webquest. There are 7 webquest questions. In a large bowl, knead almond paste to soften. Mix in egg whites and confectioners' sugar 1 cup at a time. Add vanilla. Work the mixture until it feels like pie dough. Try adding different food coloring to the dough. Shape into balls.